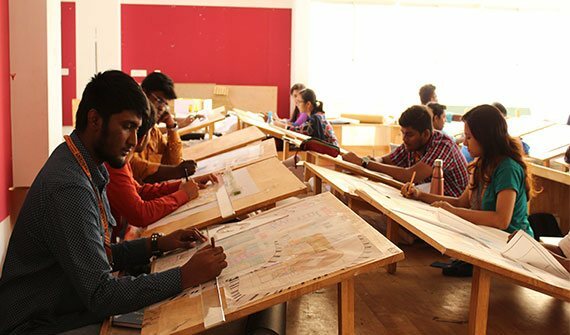 The school started with an intake of 40 and expanded to 80 in the year 2011.Since, sustainability of the built environment is the focus, diversification into specialization in interior architecture, broader understanding of urban environment and planning and management issues are to be given a thrust. Developing the school into a centre of excellence in architectural education and into Research and Resource centre will be taken up simultaneously. Efforts are underway to organize National and International seminars with focus on historicity, energy, and sustainability. B.S. Abdur Rahman Crescent Institute of Science & Technology aspires to be a leader in Education, Training and Research in Engineering, Science, Technology and Management and to play a vital role in the Socio-Economic progress of the Country. Crescent School of Architecture aims to emphasis on Curiosity, Innovation and Discovery in the field of Architecture that will connect with the profession. Aims to be the first choice for students and faculty Aspires to pursue excellence in learning through contemporary foundation of liberal learning that celebrates diversity and complexity that instills empowerment on social responsibility. To blossom into an internationally renowned University. To empower the youth through quality education and to provide professional leadership. To achieve excellence in all its endeavors to face global challenges. To provide excellent teaching and research ambience. To network with global Institutions of Excellence, Business, Industry and Research Organizations.Mission of our academy is to create opportunities for innovative academic experience which brings together academics and professional practice. To provide academic climate for students to understand, enquire, reflect, grow and contribute to succeed in a rapidly changing society. B.S. Abdur Rahman Crescent Institute of Science and Technology, Seethakathi Estate G.S.T Main Road Vandalur, Chennai- 600048.